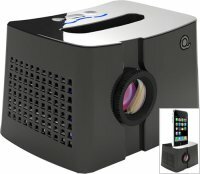 Is there room for a mini projector in our society these days? I personally think so – after all, it ain’t too much fun sharing a movie with several friends over the tiny display of the iPod touch. With the QingBar MP101 mini projector dock from Honlai Technology, you’ll be able to throw a 640 x 480 resolution image to a nearby screen or wall. That isn’t high at all by any standards, but it is understandable judging by the size of the device. The image size projected ranges from 15″ to 27″, and comes with a contrast ratio of 200:1 and a brightness of 10 to 15 lumens. You can also hook up your own speakers via a mini AV jack. Details such as pricing and availability are unknown.